The Innovate LC-1 wideband (wb) sensor allows very precise measurement and adjustment to be made to the VE table. 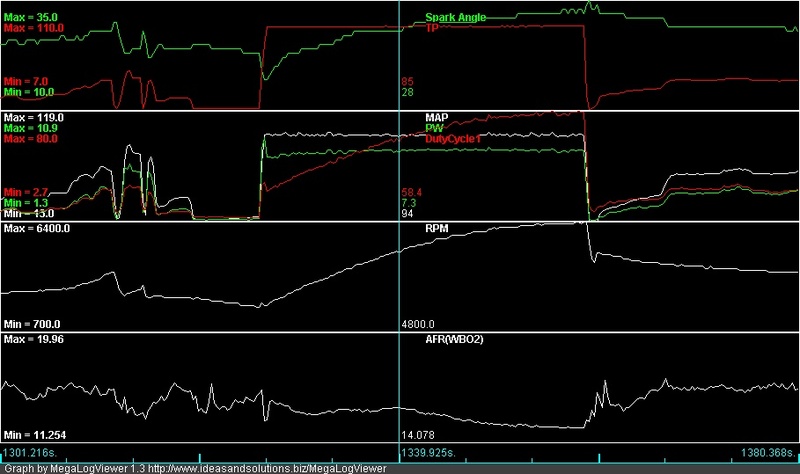 By reading oxygen content of exhaust gas in a linear format rather than just rich or lean it can tell you the exact air/fuel ratio (AFR) of your engine at any given rpm and load. It can also display this as a voltage or Lambda. AFR is perhaps the most useful as most people refer to this measurement when tuning. As a general rule when cruising AFR should be around 15:1, at full throttle around 13:1 (between 12 and 12.5:1 on a turbo engine for maximum power). However individual tuners will use figures that vary from this. As an example the Porsche 944 turbo (951) has an afr of 10:1 under full load which is very rich. There are a few things to consider though, a rich mixture will cool the cylinders, the Bosch injection system used on the cars of this era is quite crude when compared to modern efi systems. But excess fuel will wash oil off the cylinder walls increasing bore wear and diluting the engine oil. The stoichiometric afr is 14.7:1 - this is the point at which harmful exhaust emmissions such as hydrocarbons (hc) and nitrous oxides (nox) are minimized. If you are using the same megatune code as me you will need to re program the Innovate output to suit megasquirt. To do this use the LC programmer software and change the AFR settings from 7.35 to 10 and 22.39 to 20, otherwise megasquirt will show incorrect AFR readings. Also EGO correction will make your car run rich! I thought my fuel map was pretty good using a narrowband sensor until I fitted a WB. It was running very lean at full throttle (14:1) up to about 5500rpm, then it went very rich (12:1). The lean condition meant I couldn't add much advance without it pinking which restricted power. Put simply a WB is as good as a dyno when it comes to tuning, well worth the money. In fact I would say that dyno's are only usefull for a final bhp figure. One thing worth noting - a lot of modern fuels have 'oxygenators' in them which produce oxygen when they burn. This is useful for getting a thorough burn of the fuel and maximum power but any unburnt ones will be picked up by your Lambda sensor and may give false readings of the AFR. The V3 board needs a few modifications to run an idle control valve (or idle stabilization valve - ISV) like the Digifant unit. These include changing Q4 for a TIP122, removing Q20 and D8 and putting a jumper across R39. A IN4001 diode needs to go across the wires to the ISV. 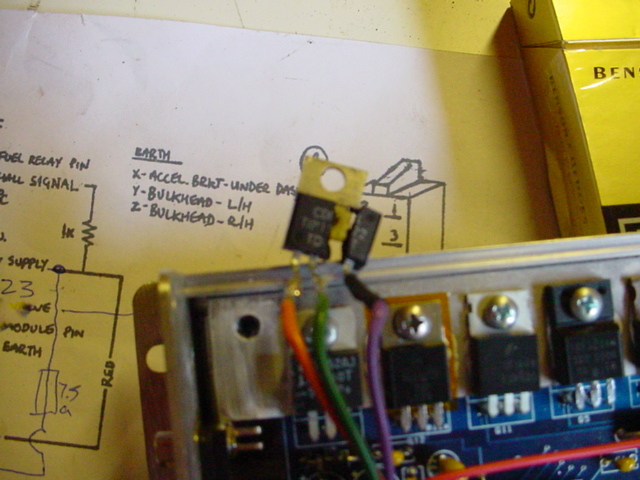 A wire also needs to be taken from the negative side of LED17 to the spark output on the V3 board. Then, in codebase and output functions, change FIDLE function to idle and LED17 to spark output. Unknown to me the TIP122 earths through its case. Insulate it properly or it will, quite literally explode! Although the idle speed was rock steady when the engine was warm, on a cold day after starting up it would idle around 4-500rpm and sometimes stall. Once a new transistor was fitted (and insulated) I played around with the settings. A setting of around 75% seemed to work quite well, although anything above would send the revs to 1500+, anything below had negligable affect. A few people have since tried and failed to get idle control working. The only successful one I know of uses the idle circuit copied from the Digifant ECU & placed on a seperate PCB inside the megasquirt case.